On the planet of Lobos, the Doctor halts a violent war between the native loba and human colonists. The TARDIS crew departs – only for Ryan to discover he’s left his phone behind. Again. Upon returning, the Doctor finds that the TARDIS has slipped hundreds of years into the future – and something has gone badly wrong. The loba are now slaves, serving human zealots who worship a figure known as the Good Doctor. It’s time for the Doctor to face up to the consequences of her last visit. With Lobos on the brink of catastrophe, will she be able to make things right…? 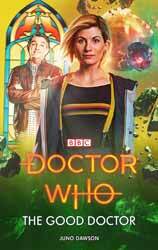 While receiving generally favourable reviews, Series 11, Jodie Whittaker’s first full season as the Thirteenth Doctor, hasn’t been to everyone’s liking. There have been some extremely negative comments – but then we are talking about a long-running science-fiction franchise, which do tend to elicit passionate views. The Good Doctor, the first original novel to feature Whittaker’s incarnation of the Time Lord, addresses certain alleged shortcomings of the most recent relaunch of the show, improving upon some of them, reinforcing others, and showing some of them not to be shortcomings at all. Let’s start with the most obvious change to have impacted upon the programme this year: the fact that the Doctor is now a woman. Some people have a big problem with this, but for me a change of gender seems perfectly acceptable as a result of regeneration – and rather more plausible than the changes of hairstyle that have often accompanied the transformation. Some say it’s a change too far, but that strikes me as a peculiar judgement to make about a show that has undergone a continual process of adjustment since it began in 1963. Sure, the Doctor has never been female before, but then the character was never played by anyone other than William Hartnell… until Patrick Troughton made his debut. The character was never an action hero… until Jon Pertwee came along. The character was never young… until Peter Davison was cast. The programme and the public have weathered all of these monumental changes, so much so that it’s now accepted as the norm that the Doctor is an often youthful action hero who has been played by a succession of actors – even though this is not how the character started out. Nevertheless, just as Star Trek: The Next Generation had the decidedly Kirk-like figure of Jonathan Frakes as Riker to help win over any old-school fans who baulked at the idea of a bald Brit taking charge of the Enterprise, Series 11’s ‘second in command’ companion Graham O’Brien is played by Bradley Walsh, who would arguably have been a safer casting choice for the part of the Doctor. Apologies for that preamble, but it is relevant, because a major plot point of The Good Doctor is based around the opinion that the Doctor has to be a man. Anyone who would have preferred the Thirteenth Doctor to be played by Walsh will find that their dreams come true (well, sort of) in this book. Following a miscommunication regarding a previous visit to the world of Lobos (which seems to be a different Lobos to the mining facility mentioned in The Space Pirates), the TARDIS crew return to find that a religion has been built up around their role in the planet’s history. The human colonists revere a godlike figure known as the Good Doctor, to whom they pray in the Temple of Tordos. However, fragmentary photographic records have led to a belief that Graham is the legendary saviour, forcing the actual Doctor to make do with the hastily improvised title of Nurse! What we have here is a satire on those fans who cannot accept the idea of a female Doctor. Women are treated as second-class citizens on Lobos, leading to the following rant from one extremist: “For a woman to claim to be the Good Doctor is the foulest, most disgusting parody of our religion.” That’s not very far removed from some of the bile you’ll find posted on the internet. A more valid criticism of the latest series of Doctor Who has been its heavy-handed moralising. The programme has always carried ethical and political messages, from the horror of the Daleks’ xenophobia to unethical capitalism on Pluto and Thoros Beta – but they have usually been couched in allegory. This year, the tutorials have been more overt, and this book follows suit. Personally, I think the topic of racism comes across perfectly clearly in the colonists’ treatment of the dog-like loba, who are even more of an underclass than human females – but just to make sure that we get it, author Juno Dawson drives home the point by having Yaz recall the prejudice she has experienced on Earth. Fortunately, because this is prose, such musings are conveyed via the character’s thoughts, rather than delivered as lectures in dialogue. For me, though, the most serious weaknesses of Series 11 have been underdeveloped characters and slender plots. Rather than being too different from what has gone before, I would argue that the new Doctor has not been different enough, her shallow goofiness being too similar to that of the Ninth, Tenth and Eleventh Doctors. Meanwhile, the development of her companions has been negligible, barring a few unsubtle moments of reconciliation between Graham and Ryan. Story-wise, the historical adventures have been the most successful, whereas the present-day episodes have tended to lack depth while the futuristic / alien settings have often seemed too sparsely populated. I regret the lack of two-parters, as I feel that stories of more than one episode would lend more substance to the characters and situations. Therefore, it’s nice to have a decent length narrative in this 230-page novel. The type is large, but I feel there’s enough material here for a new series two-parter or a classic series four-parter. In contrast to the minimal casts of The Ghost Monument and The Battle of Ranskoor Av Kolos, Dawson takes us to a world teeming with intelligent life: humans (not all of whom are happy with the status quo), loba (including compliant servants and irate freedom fighters) and hybrids of the two species. There’s a limit to what the author can do with the licensed characters, but she manages to add some layers to them. The Doctor delivers plenty of her usual motormouth remarks, but also experiences frustration as she is forced to take a back seat in the proceedings (to begin with, at least). Meanwhile, Graham struggles to live up to his reputation as the Good Doctor, and there is humour as the true Time Lord has to prompt him from the sidelines. We join the travellers in the midst of an adventure, towards the end of their first visit to Lobos. The resolution to this initial conflict is simplistic, with the Doctor telling the people, “You’ve got a choice. Peace or war? Life or death? Harmony or hate? I’ve never understood why that even needs discussion, it’s so flippin’ obvious,” but this is mitigated by the complications that follow. Surprisingly, Ryan’s phone proves to be a red herring. From the set-up in the back-cover blurb and the opening chapters, I had expected it to have some impact on the planet’s technological development, but its loss is merely a reason for the TARDIS crew to go back for it. Conversely, a spherical surveillance drone (an unobtrusive reference to Four to Doomsday) that the Doctor herself carelessly leaves behind is replicated by the authorities. Occasionally, the author seems to get a bit confused between the intervention policies of Doctor Who and Star Trek – the potential threat posed by Ryan’s phone reminded me of the end of A Piece of the Action, when McCoy realises he’s misplaced his communicator, whereas the Doctor is usually more concerned about maintaining established history than any kind of non-interference directive. While I’m splitting hairs, Dawson refers to the Doctor’s braces as “suspenders”, which is a peculiar choice of word, especially since the author was raised in West Yorkshire, not the USA. Despite its increased scope compared to the parent show, The Good Doctor remains rather basic, but then it is aimed at younger readers (I would say about ten to late teens). It’s not a great Doctor Who novel, but it is a good one.